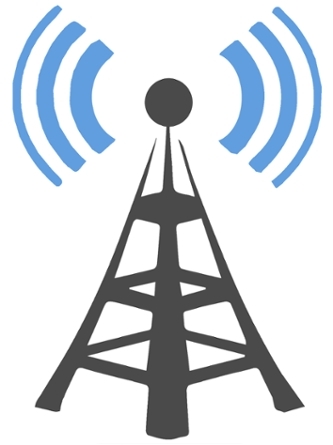 Learn about the sources and effects of radio frequency at UC San Diego. Radio frequency or electromagnetic energy is a form of non-ionizing radiation. When an RF current is supplied to an antenna, an electromagnetic field (EMF) is created to carry the signal through space. Electric and magnetic waves are emitted. This is the basis for wireless broadcasting (radio, TV) and communications (cell phones, Wi-Fi). Different objects operate/broadcast at different frequencies. RF portion of spectrum is in the range of 3 kHz to 300 GHz. The range of these frequencies is used for radio, TV, telecommunication, Wi-Fi, and satellite. They fall under non-ionizing radiation. OSHA classifies non-ionizing radiation as a series of energy waves composed of oscillating electric and magnetic fields traveling at the speed of light. Non-ionizing radiation includes the spectrum of ultraviolet (UV), visible light, infrared (IR), microwave (MW), radio frequency (RF) and extremely low frequency (ELF). Lasers commonly operate in the UV, visible and IR frequencies. Similarly to a flashlight beam, RFR radiates invisible waves outward horizontally and straight ahead, dying off in all other directions as the distance grows. RFR is characterized by long wavelength, low frequency, and low photon energy. RF differs from Ionizing radiation (x-rays, gamma rays) because it does not have enough energy to dissociate the electrons in your cells (causing cell/DNA damage). It can, however, cause them to move and vibrate, resulting in the heating of the cells. Similar to heating something in a microwave, RF heats biological tissue. If you absorb too much heat, your body may not be able to disperse it. Possible effects are similar to those of physical activity (sweating, increase in body temperature) and eventually heat stress (headache, dizziness, nausea). Extreme levels that cause this kind of heating are not ordinarily encountered by the general public. The Federal Communications Commission (FCC) regulates RF transmissions to protect people from harm. Cellular communication antennas (cell towers) are mounted several ways such as rooftop, side of building, or pole/tower mounted. Before installation, plans are reviewed to ensure their emission are within FCC limits. Wireless LAN systems (indoor and outdoor) operate on extremely low power (less than that of a cell phone). Only approved equipment can be used to build a campus operated WLAN. Microwave ovens are widely used in campus offices and research labs. It is very unusual for a commercial microwave oven to leak, but misuse, damage, and interlock failures have caused ovens to leak. Any microwave oven suspected of leaking should be taken out of service. Waveguides, co-axial cables, generators, sealers, and ovens. The most important aspect of controlling microwave/RF radiation hazards is a careful physical inspection of the source. Leaking sources will normally show misalignment of doors or plates, missing bolts or physical damage to plane surfaces. Sources, which are suspected of leaking, should be repaired and then surveyed with appropriate instrumentation to verify they are no longer leaking. There are blue, yellow, and red signs giving notice, caution, or warning to RF hazards. Read carefully and do not enter unauthorized areas. Additional notices may be put in place by the equipment owner to warn of hazards. General public: Read and follow signage — do not enter into an unauthorized area. How can I avoid or reduce RF exposure? Facility services: If you need to work directly in front of an antenna, use the information sticker to contact the carrier and shut down by site number. Use lock-out/tag-out procedures. Carriers should shut down antennas prior to repairing or conducting maintenance. Employees working at specific sites should be made aware of the antenna locations and hazards and how to avoid exposure. If you work frequently in an area near antennas that you believe it may place you over FCC professional limit, you may contact your supervisor or radiation safety office for more instructions. A monitor device can be provided.